As a Southern Hemisphere transplant, I find getting into the Halloween spirit very difficult. Halloween in Spring is just weird, no pumpkins, no autumn leaves, no frosty nip in the air. This year my daughter decided she would stand for my Bah Humbug Halloween attitude no more! She set about making Halloween decorations mid-September and shows no sign of slowing down. She has absolutely insisted that everyone in the family help out, at least a little. Whereas the tombstones are about 90% her work, and she has put A TON of work into them, each family member has contributed. That contribution, regardless of size has helped all of us get excited about Halloween....in fact, there may be some really big plans in the works now. The tombstones are made of 4 layers of a medium weight paper board, lots of tape, a couple of layers of papier-mâché and acrylic paint. Many, many hours were spent waiting for all the different layers to dry. At diner one evening my daughter asked everyone to write down suggestions for tombstone names. She read out all of the suggestions and we settled on choosing one suggestion from each member of the family. It was a very entertaining diner! Once the laborious task of assembling was finished, the tombstones received a base coat of paint. Next, the writing was added. The names and epitaphs were written in Photoshop, with some simple shading added with a Bevel & Emboss Layer Style, and printed on plain paper. Finally, touch up paint was added to blend the paper with the rest of the tombstone. There are two holes in the bottom of each tombstone, just big enough for a bamboo stick to fit inside. I cut bamboo sticks about 30 cm taller than the tombstones and hammered the sticks into the ground. The tombstones fit over the sticks. Every Halloween I gets questions from well meaning parents wishing to make masks for infants and toddlers. It has been my experience that very young children do not like things on their face, even a beautifully crafted mask. However, I think I've found a solution that will make both parents and children happy this Halloween! I added a wolf mask to the front edge of a hoodie, and the result was quite delightful! My lovely model was 4 and could probably wouldn't mind wearing a mask, but really enjoyed the hoodie. I stitched eyes that consisted of 3 concentric circles to a white background. After the eyes were stitched, I simply added them to the back of the mask. If I had this plan in mind from the beginning, I would have not cut the eye holes in the base mask and added the eyes earlier in the process. Because the muzzle can be a bit floppy I added a couple more layers of felt to the muzzle. The mask is attached to the hoodie at the center front, between the two ears. It is attached on the lower edge of the hood. The mask is also attached on the sides between the two points on the wolf's cheek. The whole process took only slightly longer than making the mask, as stitching around the eyes did take a little while, but the effect was well worth it! Sock Monsters....what happens after the socks go missing. There is always that one sock that has lost its mate forever, destine to live solo at the bottom of the sock drawer, or your favorite socks that have the unfortunate fate of becoming holey. Good-bye lonely and holey socks, Hello, Prisco-37! Made from a wool sock I bought at an Italian market many moons ago and a cotton sock on permanent loan from my son, Prisco-37 is a sample for an up coming workshop I'm teaching at Vincents Art Workshop in Wellington. Creating masks for a recent local zoo animal themed show was tons of fun. 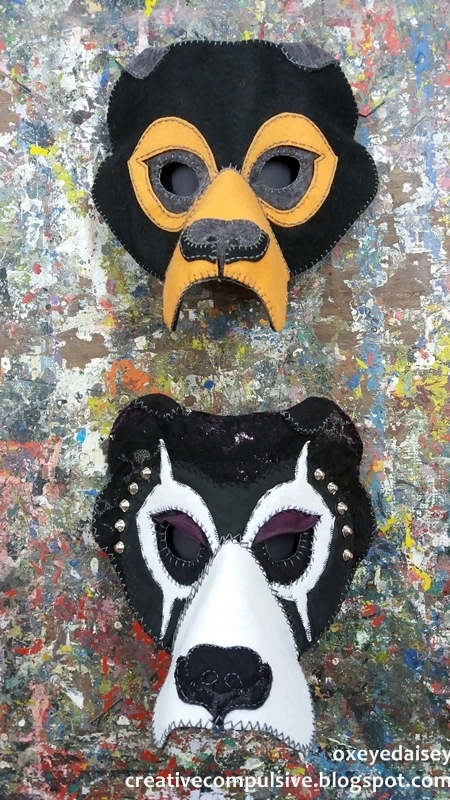 As it turns out, my Sun Bear mask design was more local zoo than I first realized. Pictured below is Sasa, the Sun Bear. 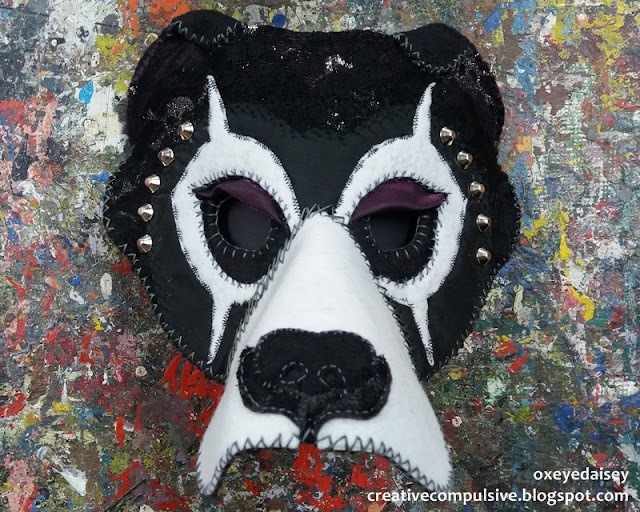 Little did I know, Sasa's mother over zealously cleaned her ears as an infant and as a result, Sasa has tiny stubs for ears....and since this was the photo I used as a reference, so does my Sun Bear mask. Recently, I had the opportunity to create zoo animal themed art work to place in an up coming exhibition. After dusting off my mask making skills, I got to work! The inspiration for my first animal mask was a Caracal, a medium sized cat found in Africa, the Middle East, and parts of India. Caracal have absolutely amazing ears, all the better to hear you with....and really fun for mask making! 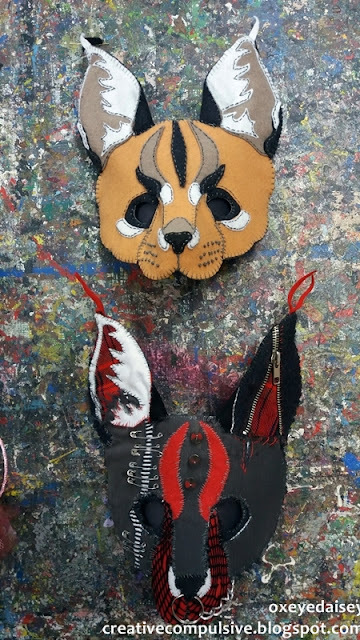 And while the Caracal was incredibly fun to make, the urge to make a Punk inspired Caracal was overwhelming.....mask number 2 was created. Introducing the hot off the press, Labrador inspired, Dog Mask PDF Pattern! It's been awhile since I've made a new pattern. This one comes from a customer request! You can find the pattern in the Etsy shop! I've always thought of myself as someone who would create no matter what the circumstances....that creativity was some how my savior, or at least a large part of my happy place. I created during the most stressful 4 years of my life, as a student at Bastyr...one of my saving graces was "drawing" my anatomy notes. I was creative during bouts of depression in my early 20's, but somehow 2014 was different...and really it all started mid 2013. July 2013 my husband and I decided that our life in Italy was unsustainable and we need a change, a great big, gigantic change. After much discussion, research and consideration we settled on moving to New Zealand. At this point in the story it is easy to say, "Oh, poor baby, moving from Italy to New Zealand," and in many aspects you would be correct....but the reality of completely uprooting your family and changing hemispheres is quite unsettling. In August 2013 we began the visa process. From August until March 2014 we fretted daily, sometimes hourly about whether or not we would get the visa, and what we should, or should not do if that became a reality. Think of a really intense roller coaster ride that lasts 7 months. Add to that the worry of finding a new job from halfway around the world. March 2014 found both the visa and the job....we were going!...going into the the complete unknown! In June all of our possessions where boxed up and put into crates. We said "good-bye" to our home of 7 years, to the only home my daughter had ever known, to all of our friends, to the friends my son had had since preschool. We said "good-bye" to our adopted Italian family, to the children's surrogate grand-parents....it was rough, very, very rough. By mid-June we had left the summer heat of Italia and entered the beginning of the New Zealand winter, in Wellington. I had managed to arrange temporary lodging for 10 days in New Zealand. During those first 10 days my husband started a new job (after 3 days), my children started school, and just in the nick of time I managed to secure more temporary housing. The last day of June we moved into a little furnished apartment in a lovely little suburb just outside of central Wellington. Wellington winter is rainy and cool and extremely windy! So while the rest of the family was at work and school I was at "home," trying desperately to make good use of my time and do something creatively meaningful....anything would do. Alas, "Funk" became my middle name, and on some days my first and last name as well. Creativity was not flowing, not even a trickle. I had bouts of depression in college, it made for some great "dark" art, but this was different. September 2014 the tides began it change, we found a fabulous "character home" on a hillside, with an amazing view, and moved in the second week of October. October I was busy getting everything unpacked and getting everyone settled...no time to worry about creativity or the lack there of. I also started a new job, in October, working once a week as a tutor at a really amazing Art Workshop space in Wellington. As part of my training, I attended a zine making workshop taught by one of the other tutors there. I attended the workshop to learn how workshops were run, but came away with so much more....or at least the spark of so much more. I went in to the workshop with no idea what so ever as to what I would make a zine about, and just started working on the first thing that popped into my head. I named my zine "7 departures....7 arrivals...Finding Home." It started out to be about the physical journey of arriving here, but ended up being a realization that it was this idea of "home" that I had been missing. I am well aware I can create through stress, and through depression, but I was surprised to learn that the creative juices dry up with out the security of "home." They say home is not a place, but a feeling, and I suppose that is true, but I needed a place where I knew I didn't have to pack up and leave any time soon, a place I felt secure, that is home....so for me it turns out home is both a place and a feeling, and an absolute necessity my creative process. I am a self-diagnosed Creative Compulsive. It all started in early childhood, drawing, painting, gluing things together, making doll clothes out of fabric scraps, and crocheting doll blankets. Now, I am Mom to two amazing kids, and an art tutor at a community art workshop in New Zealand. I am making time to draw and paint, and do more gluing things together than ever before, make plenty of patterns and costumes, still make doll clothes and crochet, and take lots and lots of pictures. Fold Along...24 Holiday Origami Projects!